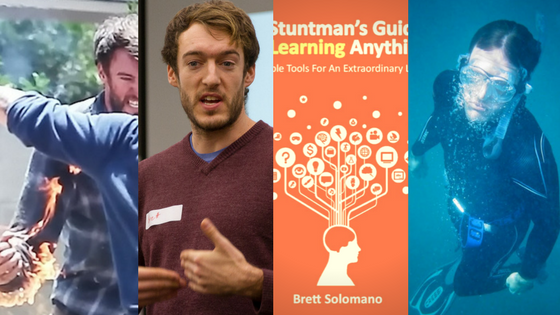 Stuntman, international author, speaker and educator on learning and self-education, Brett Solomano, shares a collection of his best tools on how to LEARN anything, DO anything and BE anything. He has made this book practical, simple and a fun read guaranteeing to inspire you to learn and grow in all areas of your life. * How to take an axe to any complex skill to chop it into smaller chunks. * The best tools to make studying a breeze and blitz any course or program. * How to never fear a performance or exam again and even shine as you do your best work. * The top tips for getting the most out of a vast community of like-minded people, surrounding yourself with extraordinary mentors. * How to take control of your life with the art of "Living Deliberately." * Why it doesn't take years to become a "master" and why you don't need to become one to be a success. * The secrets to downloading massive amounts of information fast. Not ready to buy? Want a couple of chapter for free? Sign up here and I'll give you the link.